You all must know by now that I'm obsessed with German culture and German food. I often get asked how good my German is, and to be honest, it's just ok. I can communicate at a basic level; i.e. I can order in restaurants, ask for directions, and ask and answer simple questions about myself and others, but often with grammar mistakes. (And always with pronunciation mistakes). However, I can mostly get my point across, and that's good enough for me at the moment. As is always the way with learning languages, I can understand a lot more than I can actually say, and the one area in which I've always excelled, unsurprisingly, is understanding German recipes. 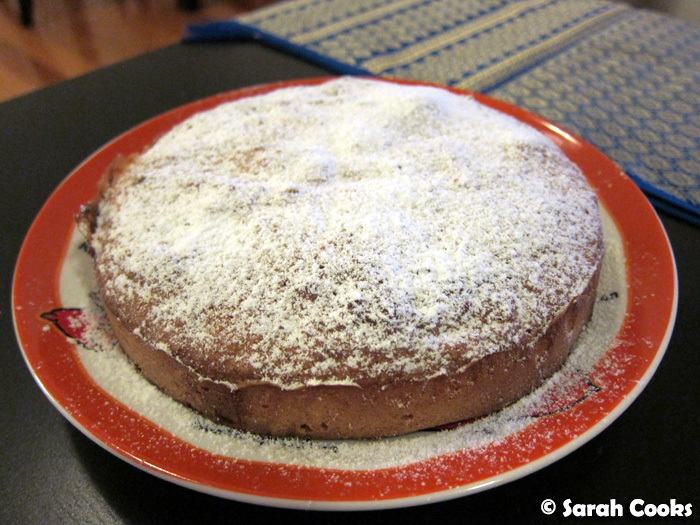 Despite that, I did struggle to translate the name of this one for you, this Saftiger Nußkuchen. 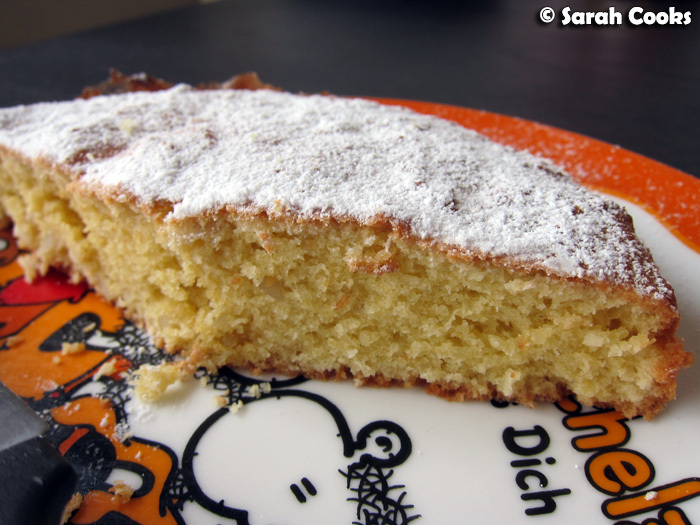 "Saftig" means juicy, and "Nußkuchen" means nut cake, so literally this is a "Juicy Nut Cake". Sounds odd in English, doesn't it? Here we don't tend to refer to cake as juicy, whereas they do in Germany. (I remember feeling very confused when Sandra's cousin in Germany said: "This pizza is so juicy!" over dinner one night, hehe.) In English, we'd most often refer to a juicy/wet/damp cake as "moist", so whilst the literal translation would be "Juicy Nut Cake", the correct translation would be "Moist Nut Cake". But, (and this is a big BUT), I absolutely, totally, cannot stand the word "moist". *Shudder* So, the unusual-sounding "Juicy Nut Cake" it remains. This whole translating thing reminds me of a wonderful Italian phrase my uncle taught me: traduttore, traditore, which literally means "to translate is to betray". Of course, the phrase loses the beauty and snappiness of the original when translated into English, which perfectly illustrates its meaning. Gorgeous! 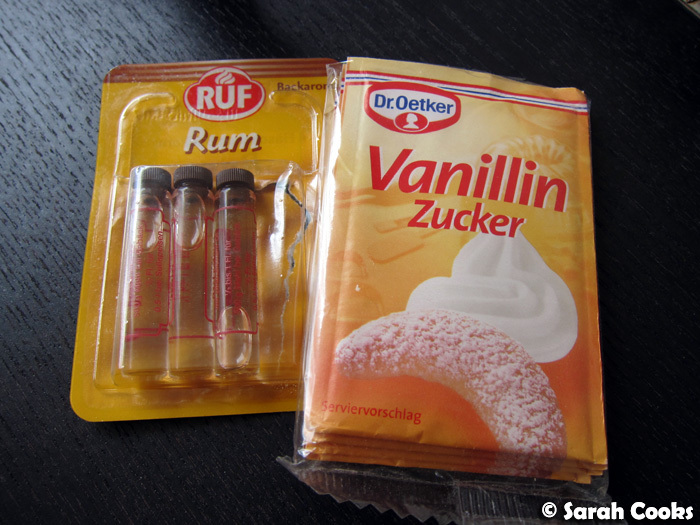 I'm often asked what can be substituted for the very German vanilla sugar and backaromen (baking flavour essences), and clearly, ordinary vanilla extract could replace vanilla sugar, and any suitable flavour essence could be used in place of the backaromen. I'm sure the results would be just fine, and, just quietly, I actually like vanilla extract better than the slightly synthetic taste of vanilla sugar. However, to make it taste like an echte German cake, just like Mama used to make when you were a kleines Kind, you really need to track down German baking products, which I find easily enough in Continental delis and specialty supermarkets like Leo's. 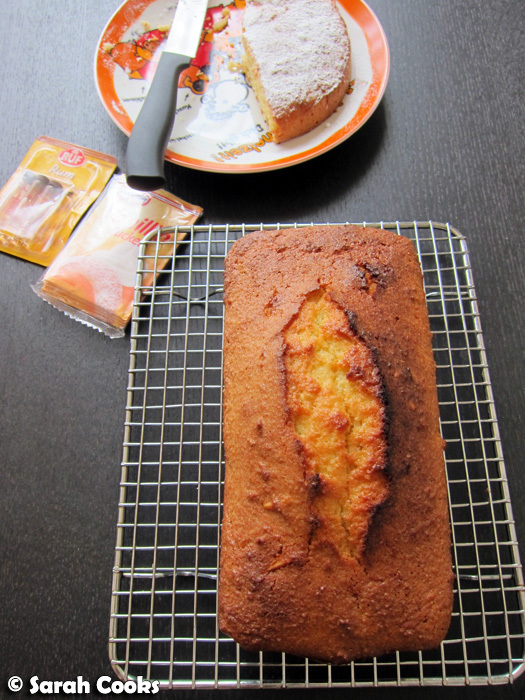 On this particular occasion, I wanted to give some of this cake away as a gift, so I divided the halved batter between an 18cm round springform tin and a small loaf tin. However, in my recipe below I suggest using all the batter in a 20cm round springform tin. 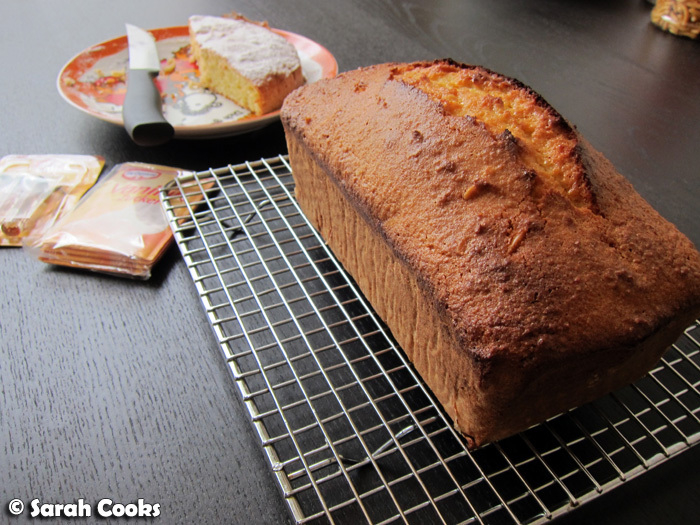 (Of course, if you want a big 26cm German cake, simply double my quantities below and bake for 45-55 minutes). This flourless nut cake is lovely and moist (or juicy? ), with a gorgeous aroma from both ground and slivered almonds. The original recipe uses hazelnut meal and chopped hazelnuts instead of almonds, which I'm sure would be good as well. The cake also happens to be gluten free - bonus! (Just make sure you use gluten free baking powder, vanilla and rum flavourings.) I like it served simply with a dusting of icing sugar, but you can also top it with an easy glaze, instructions for which are included below. Preheat the oven to 180C. Grease and line a 20cm springform tin. Separate the eggs. Whisk the egg whites in an electric mixer until stiff peaks form. Place the egg whites in a separate bowl and set aside. Using the same mixer (no need to clean it out), beat the butter until pale and creamy. Slowly beat in the sugar, vanilla sugar and rum essence. Beat in the egg yolks, one at a time. (Each egg yolk will need about 30 seconds beating). Stir the almond meal, slivered almonds and baking powder together. Fold into the butter mixture in three batches. Gently fold in the egg whites. Pour the batter into the prepared tin, and bake for 30-45 minutes, or until cooked when tested with a skewer. 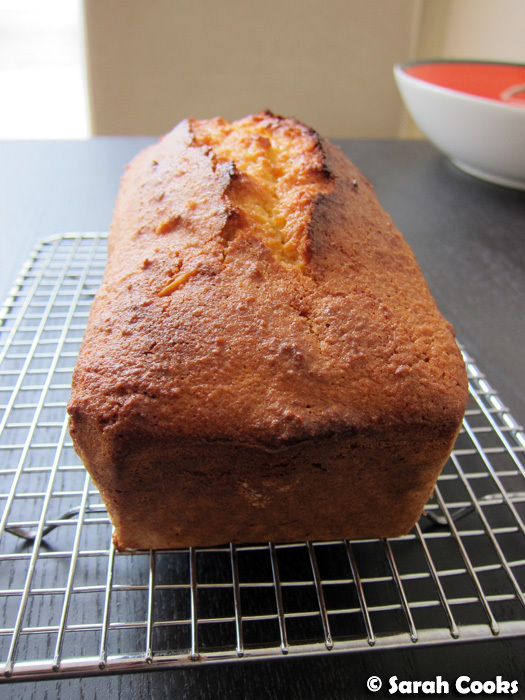 Allow to cool in the tin for 10 minutes, and turn out onto a wire rack to cool completely. Dust with icing sugar to serve. Alternative: Glaze the cake with an icing made from: 125g sifted icing sugar, 1.5tsp lemon juice, and enough warm water to make a thin, pouring consistency. Looks lecker! What about "Luscious nut cake"? Germans need bis cakes, it's, eh, normal. "Luscious Nut Cake"? I LOVE it!!! Hannah - Omg, you're totally right! That word makes me *shudder*! LOL I use moist far too often :P And I know this cake will be good because German cakes are always delicious!